Photo courtesy of Reading United A.C. In the absence of quality performances from virtually the entire Philadelphia Union squad, and in light of a more collective effort from Bethlehem Steel’s young back line, this week’s Player of the Week recognizes the individual performance of one player from the Union’s PDL affiliate, Reading United. Congratulations, Aaron Molloy. The Dublin, Ireland native and current Penn State student athlete wore the captain’s armband in United’s defeat of Lehigh Valley United Tuesday night. Reading crushed Lehigh 3-0, and it was Molloy’s brace in the first half that put the game away early. Molloy’s first goal came from outside the box, as the midfielder recognized the opportunity to score from distance. The second came off of a penalty kick, as Molloy kept a cool head and buried the shot. Molloy wore the captain’s band Tuesday, serving as a leader both on the stat sheet and in spirit for this squad of young men. 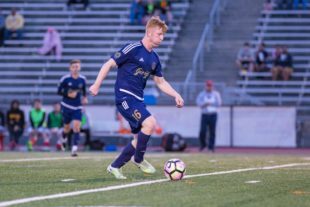 With three goals and three assists on the season, the 2017 PDL Young Player of the Year is largely responsible for Reading United’s so-far undefeated season. I was at the game last night his first goal was a real rocket of a shot!! !